Glamazon thick small flat hoop earrings by Ippolita. Ippolita Glamazon pieces are created through an innovative metal fabrication technology, by which an electric current is used to deposit metal onto a wax mold. The mold is later removed, resulting in a strong yet lightweight piece of jewelry that is seamless yet dimensional. This unique process allows for larger more abstract designs. 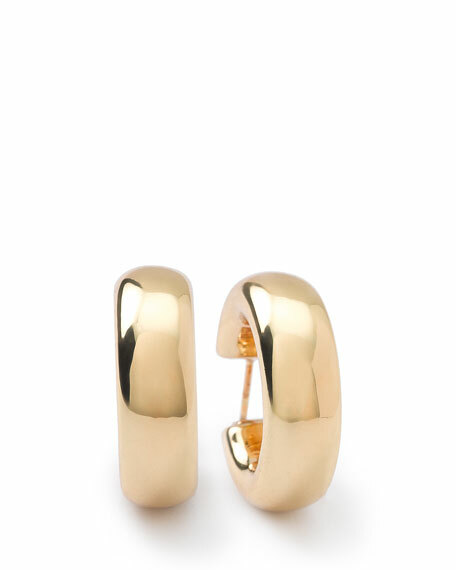 Renowned for creating effortlessly chic jewelry, Ippolita launched her successful 18-karat gold collection in 1999. Combining the rich Florentine aesthetic of her Italian heritage with a modern flair, the unique designs of her handcrafted jewelry have developed a fan base that includes celebrities around the globe.